The US digital video market remains a tale of two monetization mechanisms: advertising and subscriptions. 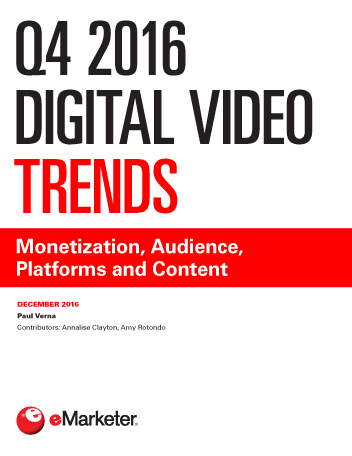 YouTube and Facebook, among others, solidified the case for video advertising in Q3 2016, while some services, notably Vimeo, Hulu and Amazon, doubled down on subscription-based approaches. Connected TV users in the US jumped by more than 20% this year. However, as the format continues to approach saturation, growth rates will level off to single digits starting next year. Smart TV usage also increased significantly in 2016 and will remain a strong growth category. Game consoles are the most popular devices for streaming videos on connected TVs and will stay there through the end of the decade. However, smart TVs will gradually close the gap, and specific devices like Amazon Fire TV, Google Chromecast and Roku will continue to gain momentum. Content platforms are led by YouTube, followed by Netflix and Amazon, both of which will keep surging over the next few years. Hulu will take a hit because of its recent decision to forgo free access in favor of paid content. The proposed merger between AT&T and Time Warner proved once again that content is king. Netflix and Amazon led among digital services for content expenditures in 2016, with outlays that put them on par with top TV and premium cable networks. "The number of connected TV users climbed 20.6% in 2016, accounting for 56.1% of the US population. By 2020, users will reach 202.1 million, confirming that watching digital video on connected TVs is a mainstream activity."